I started writing this a couple of weeks ago, not necessarily intending to send it (because fan mail is inherently creepy, isn’t it? ), but just to get the thoughts on paper. It was literal paper, too. I started with a ballpoint pen and a notebook. I’ll add that it has long been my belief that all love songs are ultimately written to god (I say this as an agnostic who likes the concision of the word “god”); that romantic longings are the pathways to our highest selves. It might be trite or cliche to tell a musician that their songs meant something to you. I probably should feel at least bit silly about how deeply I’ve gone into your songs lately. How I’ve lived in [insert album title]. But the whole point of creative work is to make connections. Songs, poems, stories, books — they’re all missives loosed into the world in hopes of finding kindred spirits. This most excellent piece of history was brought to my attention by the always-dapper Andrew J. Fletcher. 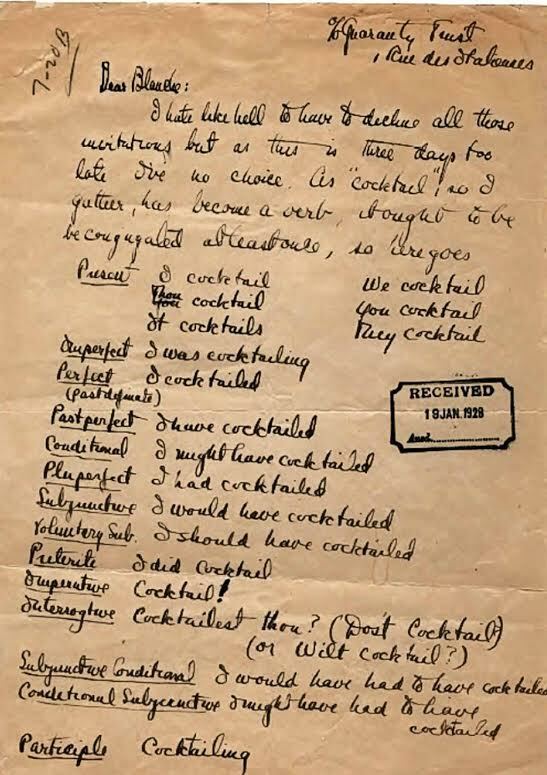 “Cocktailest thou?” is my favorite, along with Fitzgerald’s enviable penmanship.